I’ve wanted a Pentax Spotmatic since I rebooted my collection in 2006. It is a seminal SLR, the first to offer through-the-lens light metering. Finally, I have one. It is a match-needle meter. A needle inside the viewfinder shows the meter’s light reading. You adjust aperture and shutter speed until the needle is horizontal, which means you have a good exposure. It is a stop-down meter. The meter reads light only when you turn it on by sliding the lever on the side of the lens mount housing up until it clicks. The viewfinder dims when you do this because the aperture blades engage (“stop down”) to limit the amount of light passing through the lens. It is NOT, however, a spot meter, despite the camera’s name. The camera measures light across the frame and sets exposure at the average reading. Except for the light meter, the Spotmatic is entirely mechanical. And except for stopping down to meter, it works and handles just like the later Pentax K1000, which is built on the Spotmatic chassis. Unlike the K1000, however, the Spotmatic can’t use Pentax’s K-mount lenses. Instead, it uses M42 screw-mount lenses. Pentax made a very nice line of M42 screw-mount lenses, all of which had Takumar in their names. I bought a 55mm f/2 Super-Takumar for my Spotmatic. But many other manufacturers made M42 screw-mount lenses, giving the Spotmatic an incredible range of glass. I follow the blog of another collector and photographer who routinely uses his Spotmatic with a delightful Mamiya 135mm lens; see some of his work with it here. Pentax offered a range of Spotmatics from 1964 to 1976. The SP came first, accepting film from 20 to 1600 ASA and offering a focal plane shutter that operates from 1 to 1/1000 sec. Other Spotmatics offered slightly different features but all worked the same, except the last in the line, the Spotmatic F, which did away with stopping down (with SMC Takumar lenses only) and was tantamount to the K1000. The Spotmatic’s meter needs juice from a 1.35V PX-400 mercury battery that is no longer made. A 1.5V 387 silver-oxide battery is the same size, so I ordered one online. The 387 battery is just a 394 battery fitted into a removable plastic ring. The ring is durable, so I guess that next time I need a battery for my Spotmatic my options are doubled. 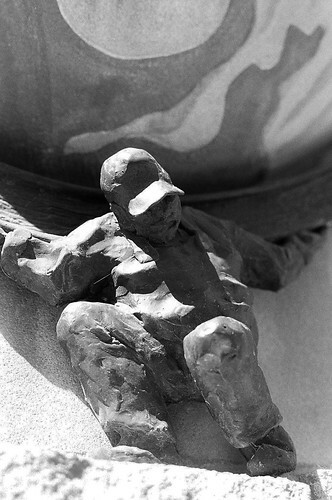 I loaded some Arista Premium 400 black-and-white film and got busy. As usual, I started in my yard. 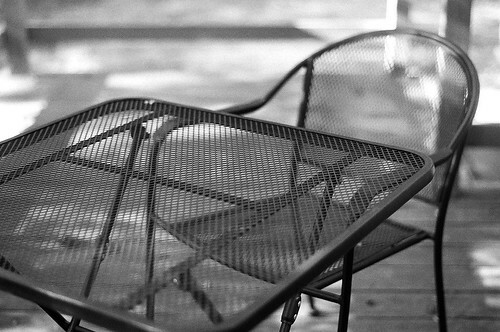 This table and chair grace my deck in the warm months. 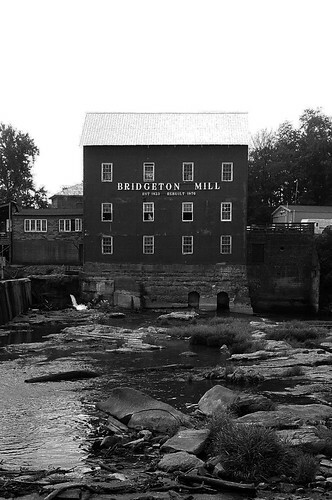 I visited the covered bridge and mill at Bridgeton and brought my Spotmatic. It was a blisteringly bright day, and I didn’t think to see if I had a yellow filter to fit my lens. So I got the dreaded white sky effect. But dig that sharpness. Here’s a photo from inside the bridge. The original 1868 bridge was destroyed by arson in 2005. Parke County, in which Bridgeton is located, is rich in covered bridges and celebrates them with a month-long festival every October. So you’d better believe locals rallied to build a new covered bridge on the original abutments. It was finished in 2006. 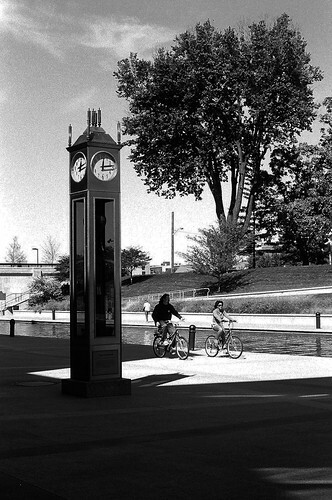 The Spotmatic accompanied me downtown on a visit to the Indiana State Museum. 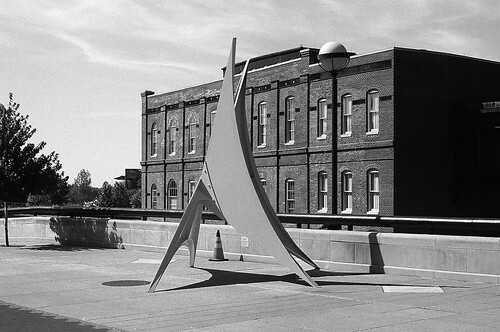 Here’s a sculpture that sits nearby. 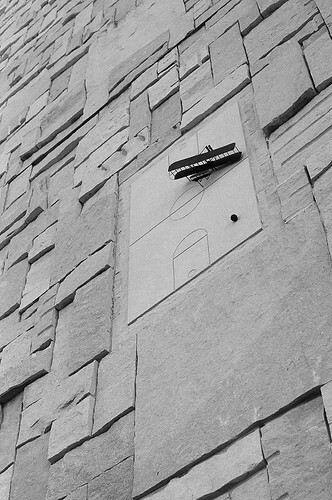 The Indiana State Museum features sculpture all over its exterior that represent each of Indiana’s 92 counties. This is the sculpture for Henry County. Wilbur Wright was born here; hence the plane. The Indiana Basketball Hall of Fame is also in Henry County. The museum backs up to the Indiana Central Canal, a waterway built in the 1830s to connect the Wabash and Erie Canal to the Ohio River. Or should I say partially built – the bill that funded this and several other transportation projects in Indiana nearly bankrupted the state, and the project had to be abandoned. Fortunately, much of the canal in Indianapolis has been rebuilt as an attraction. The downtown section makes for a lovely walk. I forget which county this little Atlas represents. But I sure thought he was interesting, so I moved in close. 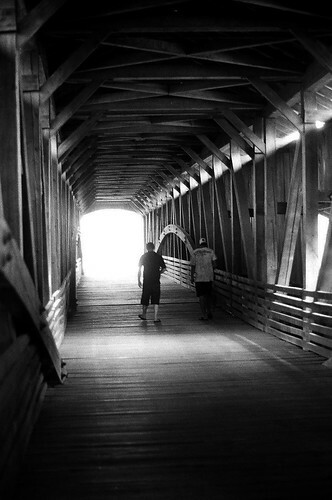 See more photos from this camera in my Pentax Spotmatic SP gallery. I enjoyed using my Spotmatic but for the stopping down. I might not mind it so much if my Pentax K1000 and my similar Pentax KM didn’t both offer open-aperture metering. The stop-down step eliminated, these cameras just handle more easily. Moreover, the meter in my Spotmatic is no longer spot on, which I hear is a common problem among Spotmatics. At Bridgeton, the meter didn’t work at all, so I whipped out my iPhone and metered using the Fotometer Pro app. My KM’s meter is still reliable and accurate, so I’ll probably reach for it when I feel like playing match-needle with my exposures and want to use good Pentax glass. But I’m glad to have experienced this Spotmatic for its historic significance. Then check out my whole collection!